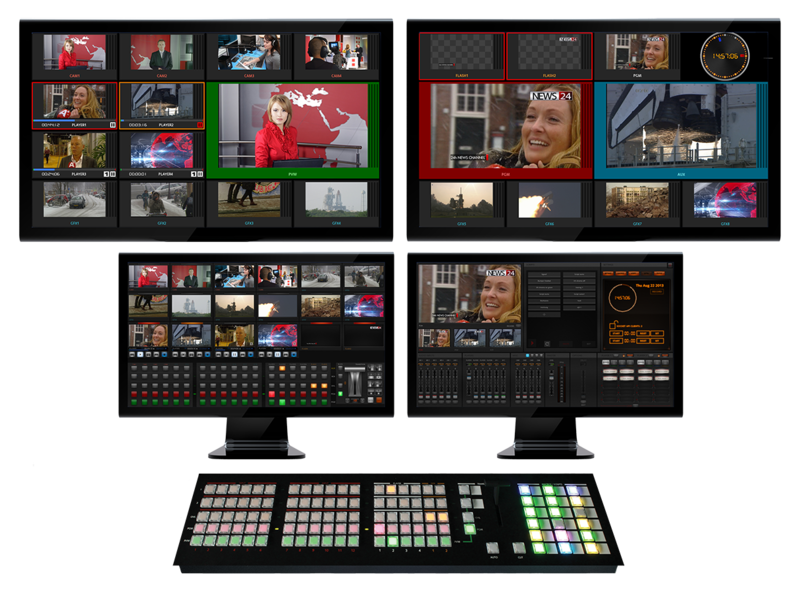 ChyronHego’s Live Compositor is a powerful and intuitive software solution for live multi-camera production that enables broadcasters, new or experienced, to create compelling, live video content without the need for technically trained personnel. Video switching and audio mixing, a powerful video effects engine, graphics powered by LyricX, multiple clip players, and robotic camera control are built-in and packaged in a simple-to-use, all-in-one solution. Live Compositor is easy to install, maintain and update, and it can be seamlessly integrated into any broadcast workflow or operate standalone. Using groundbreaking low-latency streaming technologies over the Internet, it’s possible to separate on-site equipment such as cameras and microphones from the physical location of the production gallery, creating the industry's most flexible remote production operations, resulting in a high level of cost efficiency. Live Compositor allows you to scale from an ultra-efficient one-man production workflow to a fully staffed production. Also, it’s an affordable software solution running on standard IT hardware. Who Should Use Live Compositor? Large Broadcasters. Live Compositor, as part of ChyronHego’s Camio Universe, is a great solution for daily programs following a fixed pattern such as regular news production. However, it can also be used for complex game shows with a large portion of automation and playout logic, based on data using flexible and powerful API's controlling all parts of Live Compositor. Many tasks can be automated but it’s still a flexible environment where last minute changes are not a problem. Small Regional Broadcasters. When resources - lack of skills or money - are a challenge, Live Compositor offers an affordable way to broadcast high-quality video content, and it is easy to operate, even by the smallest team. Local broadcasters often rely on a small, continuously changing team of volunteers. Independent Production Companies. The dynamic independent sector is a competitive world where you often have to balance scarce time and financial resources with high demands for flexibility. Using powerful built in macros and automation, Live Compositor can easily adapt to a wide variety of production formats. In addition, it's easy to learn and use, making it the ideal solution for independent production companies. We believe that everyone should be able to produce broadcast-quality content, with less cost, in less time. With Live Compositor, it’s all about rapid set-up times, the ability to scale from a single operator to a larger setup, and the freedom to try out new production ideas. Think, create and go live in seconds.